From the acclaimed novelist and screenwriter of The Theory of Everything comes a revisionist look at the period immediately following Winston Churchill's ascendancy to Prime Minister—soon to be a major motion picture starring Gary Oldman. 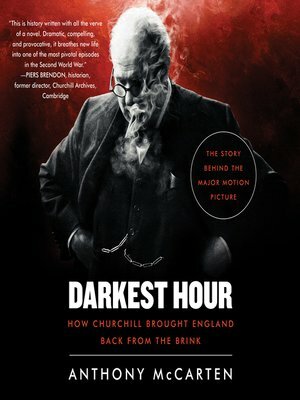 It is this fascinating period that Anthony McCarten captures in this deeply researched and wonderfully written new book, The Darkest Hour. A day-by-day (and often hour-by-hour) narrative of this crucial moment in history provides a revisionist look at Churchill—a man plagued by doubt through those turbulent weeks—but who emerged having made himself into the iconic, lionized figure we remember. Anthony McCarten is the double Academy Award–nominated and double BAFTA-winning screenwriter and producer of The Theory of Everything and is an internationally acclaimed novelist and playwright. He divides his time between London and Los Angeles.